Cooking something fun and easy can truly start the day off on the right foot. Though my kids light up when served this classic breakfast, know to many as “Toad in a Hole,” my husband and I like it quite a lot, too! Growing up, we always called over easy eggs “dippy eggs,” and we loved to dip our toast in the goopy centers. 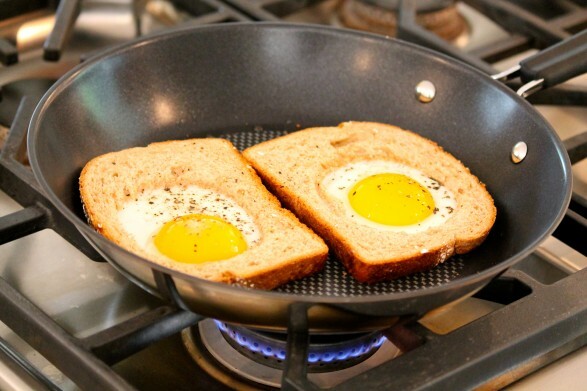 This simple egg dish is much the same, except the egg is cooked right in the toast and the cut-out center becomes the dipper. We like to sprinkle a little sharp cheddar cheese over the top. My husband is in heaven if I cook bacon first and then cook the egg and bread in the bacon grease. I actually like the buttery version a little better. Olive oil may certainly be used for a healthier version. Do you have another name for this classic breakfast? Whether you call it Egg in a Hole, Toad in a Hole, Egg in a Basket or Egg in a Boat, this easy breakfast is sure to delight. Serve with a side of fruit for a wholesome, satisfying start to the day. With the rim of a glass or a biscuit cutter, press a hole in the center of the bread. Sprinkle the egg with salt and pepper. When the egg is slightly set and the bread is golden on the bottom, flip to the other side. Flip the circle of bread, too. Sprinkle the other side of the egg with salt and pepper and sprinkle with cheese, if using. 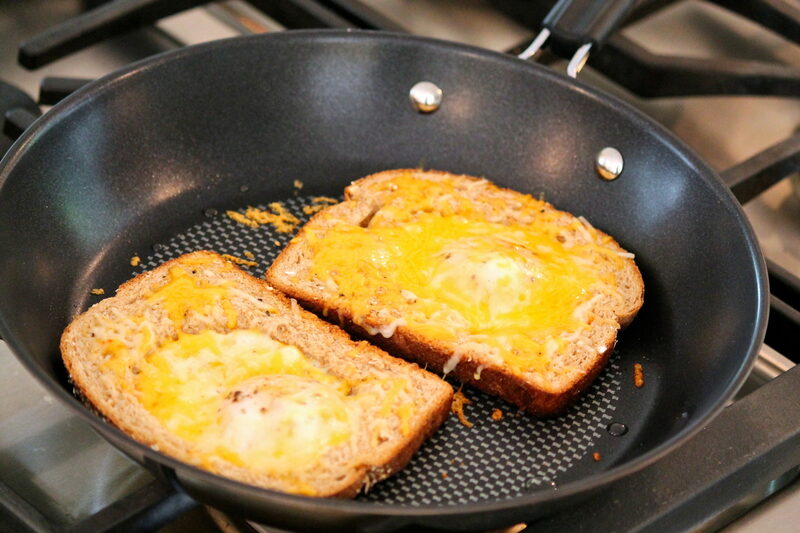 Move the piece of toast around the skillet, soaking up any additional butter. Cook until the yolk feels soft or is cooked to your liking. Serve with a side of fruit and the circle of toast for dipping! 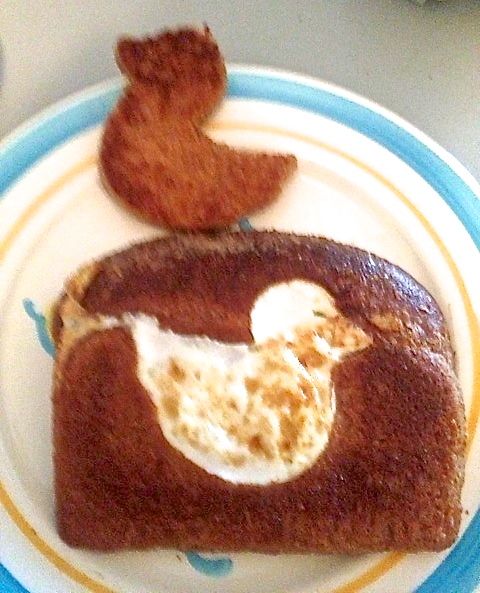 Laura, a Fountain Avenue Kitchen friend, read this post and promptly used her last egg to make this “ducky” version for her son. She said it was a major hit and she will be making often with fun new shapes! We call them birds in a nest! YUM! We call them “spit in the eye” only we don’t use cheese…just good old canadian maple syrup! My MIL called them Gas House eggs. Hubby & I had them often! We call them Birds Nests…just love them! We call them “egg in a nest.” My favorite breakfast. I never knew there were so many other names for them! I had no idea either! Oh my, I haven’t had these in years! My mom use to make these for us. She use to call them pirates eye! We called them one-eyed Jack’s! I do these French toast style, ala “French Kiss Egg Toast”. Also, for the kids or a special occasion use a cookie cutter for the hole, i.e. star, heart, flower, etc. Our grandkids call it egg-cellent toast! I love the variety of names for this fun breakfast and your story is absolutely wonderful! With the star and the song, that breakfast would have been an especially delightful way to start the day. I am sure it will forever be a special memory for your son! Instead of a glass, Grandmother used cookie cutters – it was fun picking the shape you wanted. Made these this morning on a snowy no school day. The kids picked up what cookie cutters to use. A butterfly and ginger bread man. They loves these! Thanks, what a simple and fun thing for breakfast. This will be in the rotation! Love it, Christie! Thank you for letting me know. Between the snow and the fun breakfast you created, I bet the kids’ day got off to a magical start! I love that perspective, Tom. Thanks for taking a moment to share it!